Chuck Greene wasn't the hero of Dead Rising 2. Chuck Greene wasn't the man who faced down the slow flood of zombies stumbling through the casinos of Fortune City. Chuck didn't whack a few hundred zombies with baseball bats and halt the groans of many more with sharp objects. Chuck Greene didn't do these things. In Dead Rising 2: Off The Record, the bigger, smarter disc-based version of Dead Rising 2 coming to PlayStation 3, Xbox 360 and PC this fall, the hero of last year's Dead Rising 2 has been replaced. Off The Record is a what-if: What if Frank West, hero of the first Dead Rising, was the hero of DR2? Off the Record is one of the more unusual extensions of an existing game. It was supposed to have been a simple director's cut, according to Jason Leigh, the game's executive producer from Dead Rising 2 studio Capcom Vancouver. He introduced the game to a group of reporters, Kotaku included, at a showcase for Capcom games last week in Miami. His team had planned to make the type of polished, extended edition of their game that other Capcom developers had done with Resident Evil games, but the project has changed into a full-blown re-make that tells Dead Rising 2's story as it would unfold with a different — and popular — character who killed zombies in Dead Rising 1. "If you'd been there what would you have done differently?" Frank West grumbles at the beginning of the Off The Record trailer. "My answer: everything." Well, not everything is different in this remake. Off the Record will return gamers to Fortune City, bringing them through a tweaked version of events featured in Dead Rising 2. Leigh said the game will include new areas, new psychos, use new combo weapons as well as a new save system that automatically checkpoints a player's progress when they enter new areas, reach key story points or get to the start of a boss battle. We'll control Frank and follow a narrative that fits West into these events. After the events of Dead Rising 1 when photojournalist Frank West fought a zombie outbreak at a mall in Willamette, Colorado, the story goes, he wrote a book about and then got a talk show (on which, Leigh speculated, West was probably rude to all of his guests). By the start of Off The Record, he's squandered his fame and fortune. Desparate for cash, he's agreed to take that path favored by many a washed-up celebrity: appear on a game show that involves killing zombies. Last year's Dead Rising 2 began with Chuck Greene hopping on a motorbike and using it to buzzsaw through a pit of zombies. That was his big challenge in the Terror is Reality gameshow, a show he appeared on in order to earn some money and help his daughter, Katey, who needs medicine to stave off her zombie infection. Greene wins, collects his money from two bitchy hostesses while Tyrone King, emcee of the game show, bellows about how wonderful the show is. Off The Record begins with West in red pro wrestling tights. He's on Terror Is Reality too, but his challenge is to beat back a wrestling ring full of zombies, ideally using the spinning blades in each of the ring's corners to his benefit. West spins his arms around, bashing zombies. He body slams some and hits them with steel chairs, then draws them into those spinning blades that make them mulch. West wins, collects his money from two bitchy hostesses while Tyrone King, emcee of the game show, bellows about how wonderful the show is. Slicing zombies is something Frank West is good at. So is photography, the main gameplay deviation shown so far in Off The Record. Shortly after winning his round on Terror is Reality and taking his money, West is back in civilian clothes, camera around his neck. This man has covered wars, and soon he's snooping across the suspended walkways of a storage facility, snapping photos of some shady conversation between Tyrone King and a shady guy names Brandon. This interactive sequence allowed Leigh to show how the photography system works. It was in the first Dead Rising and works similarly in this remake, rewarding players with points for every key object or person in a well-framed shot. Those important elements are circled in the photo with colored rings that indicates their special category. • Erotica, for the poster of a woman's bust labeled Juggz and for long plastic objects Leigh called "massagers"
Frank snaps one final photo of the conversation as the game show host appears to have handed the second man a bomb. Suddenly, a few thugs in black suits surround Frank. They fight him, more aggressively than their type would have in the original Dead Rising 2, Leigh explained, due to an improvement in their artificial intelligence. (Enemies, including zombies, are tougher in this new game). 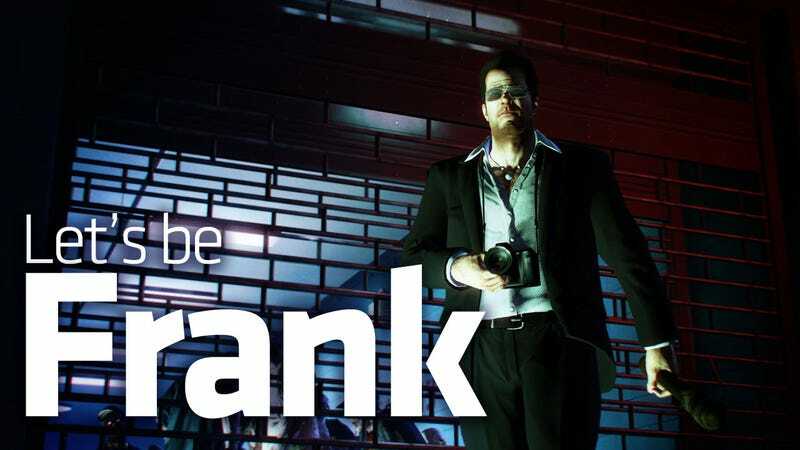 GONE DIGITAL - Some time between Dead Rising 1 and Dead Rising 2: Off the Record, Frank West stopped taking photographs with film and switched to digital. The re-make's creators use that switch to justify a new type of photo that Frank can shoot, should he get close to a zombie. Fearless of being infected (since he already is), he'll get up close to the zombie and then hold his camera at arm's length, pointing back at him and his undead pal. The result is the kind of goody close-up people take of themselves and their friends while on vacation, a trademark of our era of casual digital photography. As Greene did before him, West wanders the backstage area of Terror Is Reality a little more, has a passive-aggressive flirtatious run-in with the show's hostesses and then finds his way to an elevator. The elevator starts, then stops. West hears the crash of catastrophe, a boom and then the beginning of the panic. A zombie outbreak has begun. Like Greene, he squeezes out of the elevator and finds bedlam, people running through the halls, zombies overrunning the facility, lots of death. Brutal as they are, Dead Rising games are comedic and soon West is doing sillier things than beating zombies with a baseball bat; he's beating them with an electric guitar and cracking one-liners. He's also snapping lots of photos, each quick snap of zombie crowd filling the screen with 10, 20, 30 indicators of each zombie captured in the single photo. The group shots earn more points, which, as is series tradition, will be used to make West more powerful. We weren't shown new combo weapons, new characters, new fighting moves nor Dead Rising 2's Chuck Greene, should he be alive in this version of events. But, like Greene, West briefly takes refuge in a locker room. In Dead Rising 2, Greene found Katey hiding in a locker. In Off The Record, a little girl's backpack is on the floor, near a big bloodstain. We're left to wonder. A little girl's backpack is on the floor, near a big bloodstain. We're left to wonder. Leigh said people should think of Off The Record as a "fan's version" of Dead Rising 2, suggesting that this new zombie-crowd-killer is aimed to be the ultimate gamer-crowd-pleaser. He promised that load times would be shorter. than they were in Dead Rising 2. Some difficulty spikes have been smoothed from the original Dead Rising 2, Leigh told me, because they annoyed the game's developers when they played the game. He declined to say if the game's inventory system would be revised. The one in Dead Rising 2 forced players to repeatedly re-create favorite combo weapons. Co-op play will return in Off The Record, putting one player in control of Frank West, the other of Chuck Greene. We got no further details on that, nor on a new mode being added to the Dead Rising 2 series. Another reporter speculated that it might be a mode that frees the game of its three-day time-limit, the ticking deadline clock that guarantees a game over. Leigh wouldn't answer that. Off The Record is an unusual creation. Fans of Dead Rising 2 have had three separate releases related tof the game in the last year, starting with its late-summer prologue through its December 2010 epilogue (which guest-starring Frank West). Do they want more? And do fence-sitters want the non-canonical but possibly ultimate edition of the game? This is a return journey filled with twists. If nothing else, it's the sure choice for those who believe that it might be cool to be a former motorcycle racing champion, but it's cooler to be a grouchy, jaded journalist.